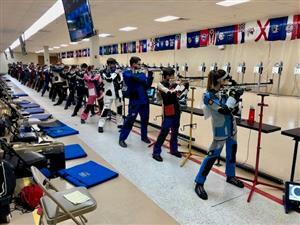 Boca Ciega High School senior Megan Nelson placed ninth overall at the National Air Rifle Championships in the JROTC's Army category. The competition featured more than 7,800 competitors. After several rounds of elimination, only 150 precision class competitors made it to the National Championships in Anniston, Alabama. In addition to placing ninth in the Army division, Megan placed twenty-ninth overall for all services. Megan was also awarded a silver distinguished marksmanship badge and will pursue a gold distinguished badge at the State Junior Olympic Trials in May. The Boca Ciega High School's Marksmanship Team has earned 4 gold distinguished badges in the past 5 years. Congratulations Megan!